Follow-up on Heitz et al. This work is a follow-up on the recent work of Heitz et al., who introduced a theoretical framework to derive multiple scattering BSDFs. 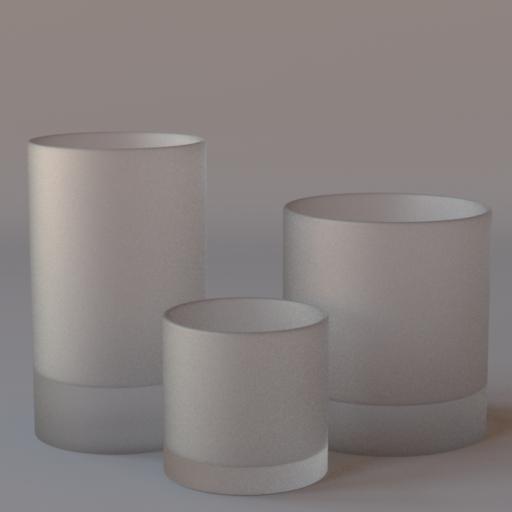 This contribution was important to simulate materials such as frosted glass for instance (most current material models ignore multiple scattering effects, which leads to energy loss; hence the darker result in the illustration). In order to arrive at this result, Heitz et al. treated rough surfaces as volumes. In this paper, we derive a slightly different theory that can arrive at the same results, but we focus primarily on a different problem: the construction of a unified representation for surfaces and volumes. I am going to motivate this problem with a practical example. If you want to render an image such as this one (image taken from Star Wars Ep. 7: The Force Awakens), you would currently have to rely on two different rendering algorithms. This is because this image contains two types of objects: some are surfaces (the spaceships, the water surface, the building in the background), and others are volumes (the explosions, the clouds, the smoke, and the foam in the foreground). Currently, the way we represent surfaces and volumes is different and, more importantly, incompatible. Here is what I mean by incompatible: if we take a surface representation such as this one (tie fighter model created by James R. Bassett http://www.jrbassett.com/) and convert it into a volume (which we can do with, e.g., a voxelization algorithm), the object will render differently. This is the image we get from the volume representation. Notice how very different it is from the surface rendering of the previous slide. Clearly, something was broken during the conversion (note: in this image I used a fairly low voxel density value to make sure that the differences would be visible on a projector; you can scroll downwards to see other renderings with higher density values, which are also different from the surface rendering). Let's look at our volume rendering more closely. 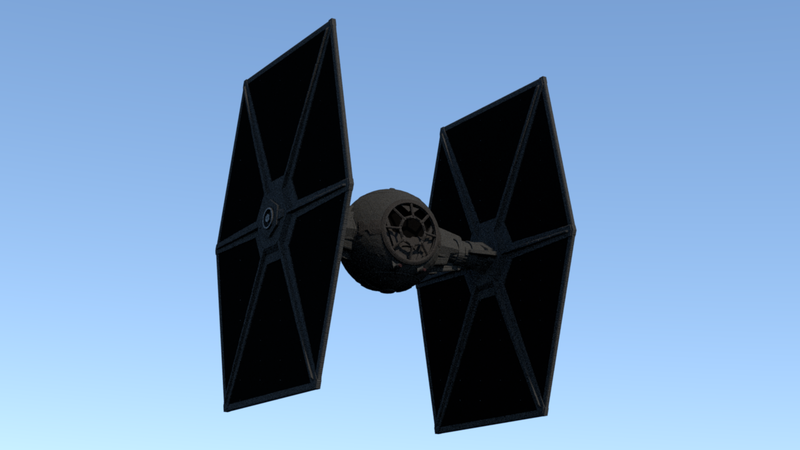 Looking at the red section, we notice that the cockpit is leaking through the wing of the volumetric tie fighter. This means that the representation allows light to pass through it, as illustrated in the lower right caption. 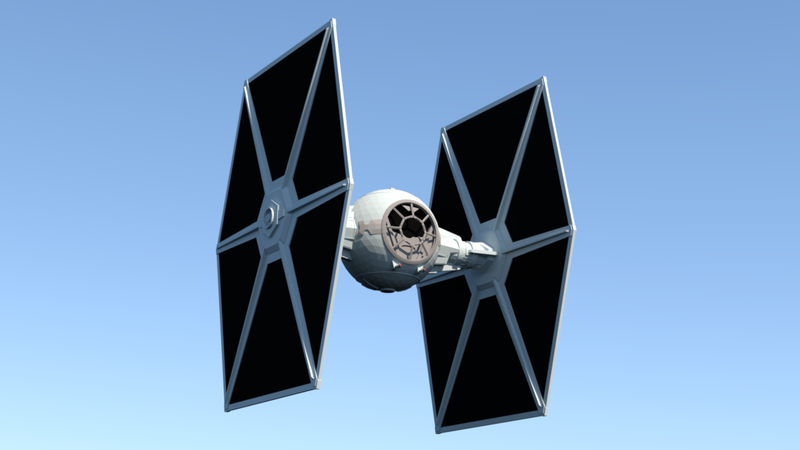 In contrast, the surface tie fighter is completely opaque in the red section, which means that the wing does not allow light to pass through it. Based on this observation, we deduce that the light transport is different between the surface and the volume representation. So in this paper, we explored the feasability of having volumes that produce surface-like light transport. We believe that solving this problem is what will allow us to unify surface and volume representations. Since we were dealing with light transport, we also wanted to rely on theoretical models that would help us control it. To that end, we turned to microfacet and microflake theories, which are currently the most general models we have at our disposal. What is responsible for surface light transport ? What is responsible for volume light transport ? How to make a volume act as a surface ? Before diving into the details of our contribution, I must mention that our paper is purely experimental, which means we haven't solved our problem entirely; but we did make some progress. Our paper is mostly about sharing this progress along with the insights/ideas we investigated. In the remainder of this presentation, I am going to introduce microfacet and microflake theories, and point out the components they designate as responsible for light transport. Once these components identified, I will show how we related both theories in our paper by building a volume that produces surface-like light transport. Finally, since this is a work-in-progress, I will point out the remaining open problems we think need to be solved to arrive at a unified object representation. 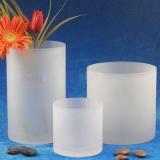 Microfacet theory is a framework to explain the optical behavior of surfaces, i.e., materials. It assumes that macroscopically smooth surfaces are actually composed of microscopic facets, i.e., microfacets that can scatter and/or absorb light rays. In computer graphics, we use this theory to derive plausible materials. In order to derive a material, we need two main components. 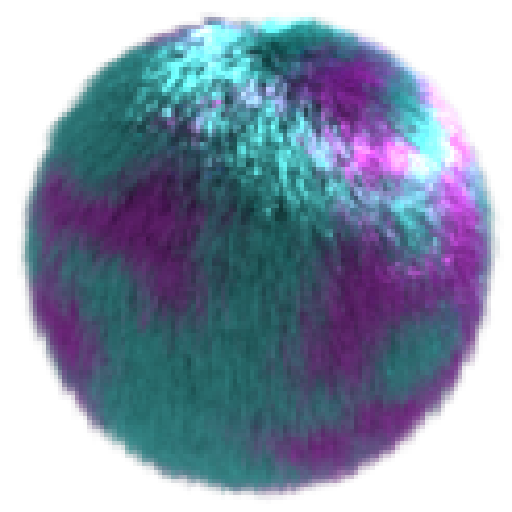 First, there is the micro-BSDF, which defines how a light ray reacts when it intersects a microfacet. 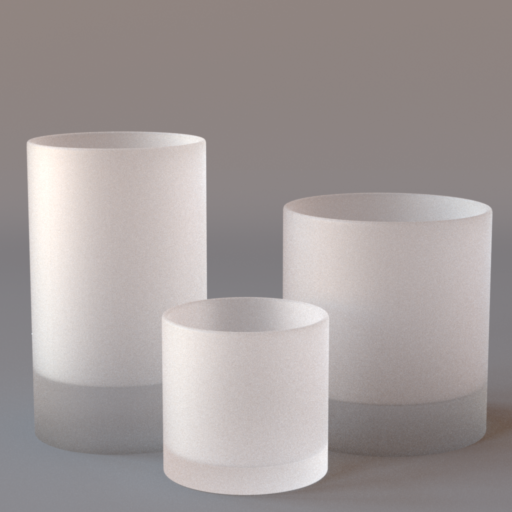 The micro-BSDF defines the category of the material, e.g., conductor, diffuse, dielectric, etc. Second, the distribution of microfacet normals (NDF) defines how rough the surface is. A smooth microsurface (described by sharp NDF lobes) will produce sharp reflections. Conversely: a rough microsurface (described by large NDF lobes) will produce blurry reflections. Here is an animation that shows the link between a synthetic microsurface and surface appearance. We can also create anisotropic reflections by stretching the microfacets. The NDF is thus the key component that drives light transport for a specific material. We have seen that the components that drive light transport on a surface are related to its microgeometry, which is governed by the distribution of microfacet normals, or NDF. Let's move on to microflake theory. Microflake theory is a framework to explain the optical behaviour of volumes. It assumes that macroscopically smooth volumes are actually composed of microscopic flakes, i.e., microflakes that can scatter and/or absorb light rays. In computer graphics, we use this theory to simulate plausible participating media. In order to derive a medium, we need three components. First, there is the density field, which gives the amount of microflakes that are located within an infinitesimal volume element. The bigger the density, the shorter the rays are expected to travel before intersecting a microflake. Scroll downwards to see the effect of increased density on a microflake volume. (Note that no matter how density is tweaked, we still don't get close to our original surface because the light transport is still different). Second, there is the micro-BSDF, which defines how a light ray reacts when it intersects a microflake, just like in microfacet theory. 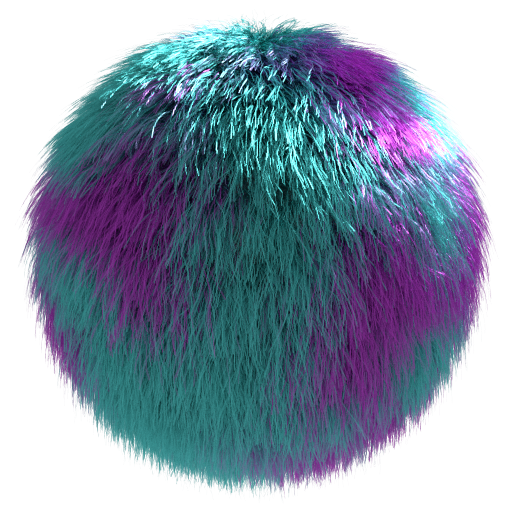 The micro-BSDF gives us the category of the medium we derive, e.g., specular, diffuse, etc. Finally, the microflake NDF describes how the flakes are oriented within an infintesimal volume element. Just as for microflacet theory, the NDF is a key component to drive the light transport. Just like microfacet theory, the main components that drive light transport in a volume are related to its microgeometry, which is governed by the microflake density, and the distribution of microflake normals, or NDF. In light of the similarities between microfacet and microflake theory, is it possible to create a volume whose microgeometry produces surface-like light transport ? The answer is yes, and here is how. We start with a semi-infinite medium. The medium is homogeneous, which means that on average, we expect to have the same number of microflakes inside any infinitesimal portion of the volume, no matter its location below the interface. Finally, we describe the orientations of the flakes with a microfacet NDF. Note that microfacet NDFs differ from traditional microflake NDFs in that they are nonsymmetric. Geometrically, the microfacet NDF produces somewhat odd-behaving flakes that scatter rays in certain directions and let them through in their opposition directions. This assymetric behaviour is what produces surface-like light transport, because it ensures that light escapes from the volume without scattering as if it was evolving inside a conventional microflake volume. We have thus derived a microflake volume that produces surface-like light transport, whose behaviour is entirely controled by the microfacet NDF. In the case of a perfectly smooth surface for instance, we have the guarantee that light will bounce off the microflakes only once, which is what we would expect to happen on a surface. The rendering shows a surface rendered with such a microflake configuration. Despite the fact that we are using a volume, the final apperance is that of a surface. Here is another example with a rougher NDF. We have showed that a semi-infinite microflake volume could act as a surface by using a microfacet NDF. 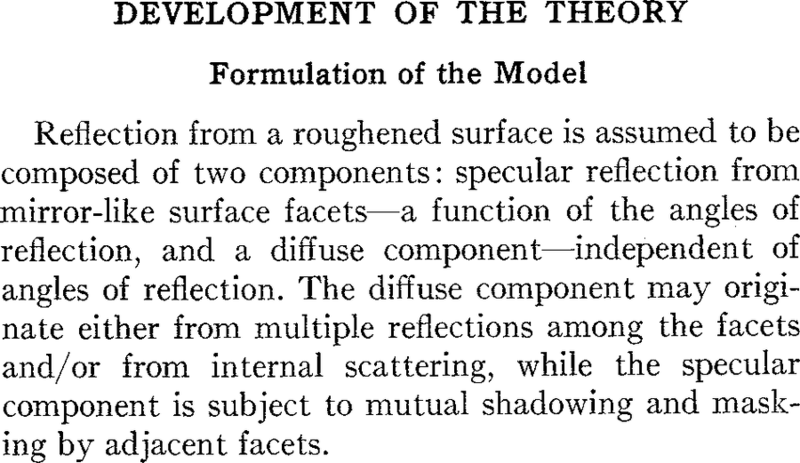 Effectively, this means that microfacet theory is just a special case of microflake theory. This is the theoretical result we wanted to share. The fact that we can create a microflake volume that acts as a surface does not solve our unification problem. A unified representation for surfaces and volumes should be able to treat both cases at the same time. 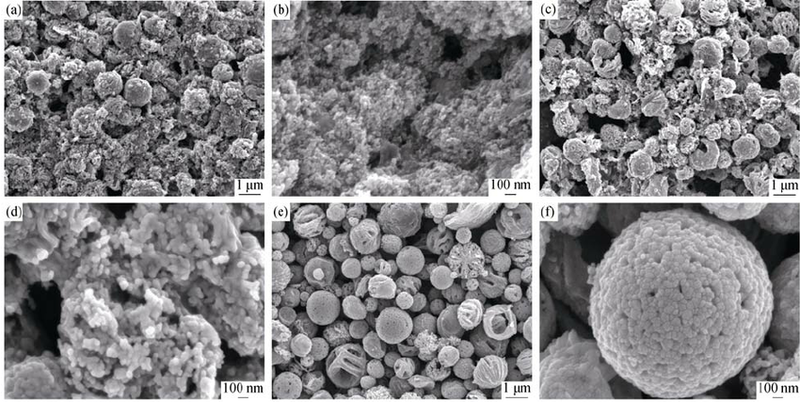 Currently, we do not know how to mix semi-infinite configurations within a conventional microflake volume, as well as symmetric and nonsymmetric microflake NDFs. $\Rightarrow$ How to support both types of microflakes inside a single medium ? Nevertheless, our theory can be used to derive new types of materials. As Heitz et al. showed in the paper we build upon, modelling a surface as a volume allows to compute any order of scattering. Our derivations are different (they are actually mathematically simpler and more numerically stable) from those of Heitz et al. but yield the same multiplescattering BSDFs. Note however that multiple scattering has to be computed stochastically with a Monte Carlo simulation. This contrasts with analytic single BSDFs that are analytic, but loose energy as roughness increases. In order to make our BSDFs more computationally efficient, it would be interesting to find closed forms for the BSDFs. We believe this might be possible as our model holds the Chandrasekhar BRDF as a special case, which has a closed-form solution. $\Rightarrow$ Can we generalize to other NDFs ? Maybe there is a way to generalize Chandrasekhar's model to other NDFs and hence other materials ? This is an open problem. Another open problem we are interested in is the modelling of semi-porous surfaces. A lot of physical microsurfaces are neither heighfields or volumes but something in between. Maybe there is a way of handling such interfaces by employing a specific NDF... Could an NDF slightly leaking below a hemisphere work ? We don't know. Semi-porous interfaces are still an open problem. The last topic I want to talk about is level-of-detail. Volumes are expensive: they consume a lot of memory compared to surface representations. In order to reduce this memory consumption, we should have the ability to load lower resolutions as the objects get smaller on screen. When downsampling a volume, we need to make sure that light transport is preserved across lower resolutions, and this is not an easy problem: we only know how to downsample microflake NDFs since very recently; see "The SGGX Microflake Distribution". Downsampling other attributes such as densities and albedos remain open problems. Perhaps a better understanding of surfaces and volumes could help on this topic?